In January of 2014, President Barack Obama sat down at his first cabinet meeting of the year and outlined his strategy for governing his final few years in office. “I’ve got a pen, and I’ve got a phone,” he famously said laying out his plan to circumvent Congress and use executive orders to push his policies onto the American people. “One of the things that I will be emphasizing in this meeting is the fact that we are not just going to be waiting for legislation in order to make sure that we are providing Americans the kind of help that they need,” he continued. Because those pesky laws brought forth by elected officials were getting in the way. Fortunately for America, President Trump has found it rather easy to rescind those executive orders and unwind Obama’s legacy step by step, executive order by executive order. “Obama has built almost his entire legacy on executive orders (pen and phone) rather than to go through Congress, only to have them rescinded by the next president,” writes political cartoonist A.F. Branco. Using his own executive orders or reversing those already in effect, Trump has withdrawn the United States from the Trans-Pacific Partnership, reversed government overreach in interpreting the Civil Rights Act to extend to transgender workers, rescinded an Obama favorite in reducing mandatory sentences for criminals, reversed a ban on drilling for oil in the Arctic, and rolled back his predecessor’s diplomatic efforts with communist Cuba. 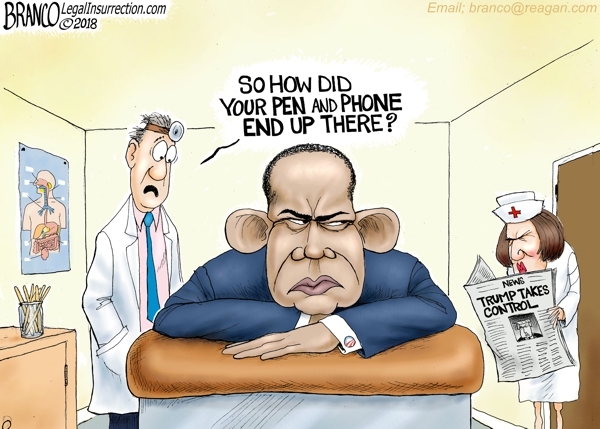 Isn’t it ironic that it’s the “pen and the phone” that’s dismantling Obama’s legacy? That’s why legislation trumps regulation. Now that pen and phone are in the same place Obama’s legacy is going to end up – where the sun don’t shine. Do you support President Trump’s strategy of using Obama’s governing precedent to reverse his legacy? Tell us why or why not in the comments section below!